Who should not take Prinivil? What conditions does Prinivil treat? Lisinopril may rarely cause serious (possibly fatal) liver problems. Get medical help right away if you have any symptoms of liver damage, such as: nausea/vomiting that doesn't stop, loss of appetite, stomach/abdominal pain, yellowing eyes/skin, dark urine. List Prinivil side effects by likelihood and severity. What should I know regarding pregnancy, nursing and administering Prinivil to children or the elderly? Some products that may interact with this drug are: aliskiren, certain drugs that weaken the immune system/increase the risk of infection (such as everolimus, sirolimus), lithium, drugs that may increase the level of potassium in the blood (such as ARBs including losartan/valsartan, birth control pills containing drospirenone), sacubitril. Does Prinivil interact with other medications? 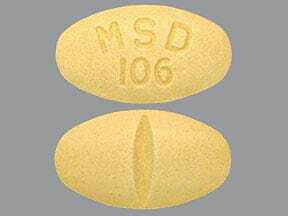 This medicine is a light yellow, oval, scored, tablet imprinted with "MSD 106". 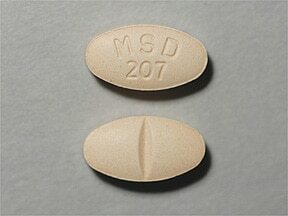 This medicine is a peach, oval, scored, tablet imprinted with "MSD 207". 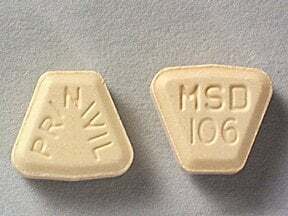 This medicine is a light yellow, shield, tablet imprinted with "PRINIVIL" and "MSD 106". Are you considering switching to Prinivil? How long have you been taking Prinivil?